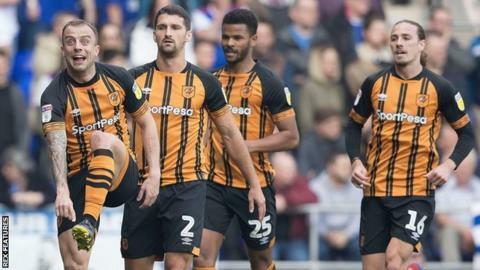 Kamil Grosicki scored twice at Portman Road to keep Hull City's outside Championship play-off hopes alive, while edging bottom club Ipswich Town a step nearer the drop. Grosicki was set up for his first on 14 minutes by Fraizer Campbell before firing his left-foot shot past a fellow Pole, home keeper Bartosz Bialkowski. Campbell then went off injured on 38 minutes but it did not halt Hull's progress as they scored again four minutes after the restart, top scorer Jarrod Bowen breaking at pace down the right to set up Grosicki for his second. Ipswich remain 13 points adrift of safety - but now with only seven games left. Hull are within five points of the play-off places, after Middlesbrough, who started the day in sixth, lost their teatime clash with leaders Norwich City. The Tractor Boys had a succession of first-half chances, as Myles Kenlock and Gwion Edwards both fired narrowly off target, before Kayden Jackson and Edwards saw efforts cleared off the line by Eric Lichaj and Marc Pugh respectively. But four minutes into the second half Bowen evaded three Ipswich defenders in a surging run down the right before teeing up a second goal for Grosicki, who, prior to the game, had not scored since the 2-0 win at home over Stoke on 2 February. Ipswich continued to make chances but could not find a way past David Marshall, who twice denied Alan Judge and repelled efforts from substitutes Idris El Mizouni and Collin Quaner, while Jackson fired wide. But the visitors went close to adding a third in the closing stages when Bialkowski bravely dived at the feet of Bowen to prevent him from shooting, before Pugh was denied by a post in injury time. "I don't think we deserved to lose. We started the game well, we got hit with a poor goal. "After that we were really, really good. It was all us. "The pleasing thing was we never wilted or capitulated, we kept on pushing them back. "It's going to be really, really tough (to survive relegation) but as long as that white flag doesn't go in until it's mathematically over, you keep fighting, you have a duty." "We have come away from home, we have scored two excellent goals. We have addressed the away form...could have played better? Definitely. "We have got ourselves through the game. We have gone and done what we had to do today. "We are always striving for better. For me it was an important three points because it keeps us in the race. "We are in the race (for the play-offs), who knows what is going to happen. The next game is the most important one now." Match ends, Ipswich Town 0, Hull City 2. Second Half ends, Ipswich Town 0, Hull City 2. Attempt saved. Collin Quaner (Ipswich Town) left footed shot from the centre of the box is saved in the bottom left corner. Assisted by Gwion Edwards. Marc Pugh (Hull City) hits the right post with a right footed shot from the centre of the box following a fast break. Foul by Chris Martin (Hull City). Offside, Ipswich Town. Alan Judge tries a through ball, but Gwion Edwards is caught offside. Hand ball by Jarrod Bowen (Hull City). Attempt saved. Idris El Mizouni (Ipswich Town) right footed shot from the left side of the box is saved in the top left corner. Assisted by Myles Kenlock. Substitution, Hull City. Evandro replaces Kamil Grosicki. Offside, Ipswich Town. Myles Kenlock tries a through ball, but Gwion Edwards is caught offside. Attempt blocked. Kamil Grosicki (Hull City) left footed shot from the centre of the box is blocked. Assisted by Eric Lichaj. Attempt blocked. Alan Judge (Ipswich Town) right footed shot from the right side of the box is blocked. Assisted by James Bree. Substitution, Hull City. Robbie McKenzie replaces Reece Burke because of an injury. Substitution, Ipswich Town. Idris El Mizouni replaces Cole Skuse. Delay in match Reece Burke (Hull City) because of an injury. Corner, Ipswich Town. Conceded by Todd Kane. Attempt saved. Alan Judge (Ipswich Town) right footed shot from a difficult angle and long range on the right is saved in the bottom right corner. Assisted by James Bree. Corner, Ipswich Town. Conceded by Jordy de Wijs. Corner, Hull City. Conceded by Cole Skuse. David Marshall (Hull City) is shown the yellow card. Eric Lichaj (Hull City) wins a free kick on the left wing. Substitution, Ipswich Town. Collin Quaner replaces Kayden Jackson. Attempt missed. James Bree (Ipswich Town) right footed shot from the right side of the box is too high. Attempt missed. Kayden Jackson (Ipswich Town) right footed shot from the right side of the box is too high. Assisted by Andre Dozzell. Hand ball by Gwion Edwards (Ipswich Town). Offside, Hull City. Daniel Batty tries a through ball, but Kamil Grosicki is caught offside. Attempt missed. Alan Judge (Ipswich Town) right footed shot from the centre of the box is close, but misses to the right. Assisted by Gwion Edwards. Corner, Hull City. Conceded by James Bree. Goal! Ipswich Town 0, Hull City 2. Kamil Grosicki (Hull City) right footed shot from the right side of the box to the bottom left corner. Assisted by Jarrod Bowen following a fast break. Chris Martin (Hull City) wins a free kick in the defensive half.